Now that you know the basics of a wedding invitation suite and you've got the pretty paper goods, it's time to start thinking about the extras and adornments! These pieces are certainly not considered necessary, but they are yet another opportunity for you to add a more personal touch to your invitations. Do keep in mind that in addition to the cost of design and production, these add-ons may also add to the total amount you spend on postage. But if you're going all out with your paper goods, incorporating a few thoughtful design details can really elevate your stationery as well as your guests' experience. Read on for inspiration and to learn a little more about your options! Ribbon is hands-down one of my very favorite accent pieces for invitation suites. Whether you opt for an organic recycled chiffon or a delicate Habotai silk, using ribbon to (literally) tie your stationery together is an easy way to add a luxurious feel to your suite. I also love adding calligraphy accents to ribbon, but those pieces are likely more practical for a bouquet or vow books than for a hundred invitations! The rich texture and semi-opaque quality of vellum makes it an ideal accent piece for your wedding stationery. Whether you use a flat sheet as your invitation, incorporate a patterned wrap to hold your suite together, or even opt for a vellum envelope, this material always adds a ton of character and visual interest. Vellum comes in different weights just like regular paper, so you'll be able to choose the appropriate thickness for however you plan to incorporate it into your invitation suite. If you want to add a bit of old-school flair to your wedding stationery, wax seals are a fantastic option. There are a lot of pre-designed options available nowadays, but you can also have your stationery designer customize a small illustration or monogram. Although they can literally act as seals, I would recommend that you do not use them on your outer mailing envelope — it's likely that they'll suffer damage or fall off through the machine sorting process (and general wear and tear) at the post office. Instead, consider using them to seal a vellum wrap, to top off your ribbon, or even as decoration at the top of your invitation. Hiring a calligrapher for your envelopes can be pretty pricey, but the results are beautiful and will really set the tone for your guests. Some calligraphers offer a variety of script options, while others specialize in a specific style. Be sure to do your research and find someone who can create the style you're looking for — modern brush lettering, organic fine line script, traditional pointed pen calligraphy, etc. 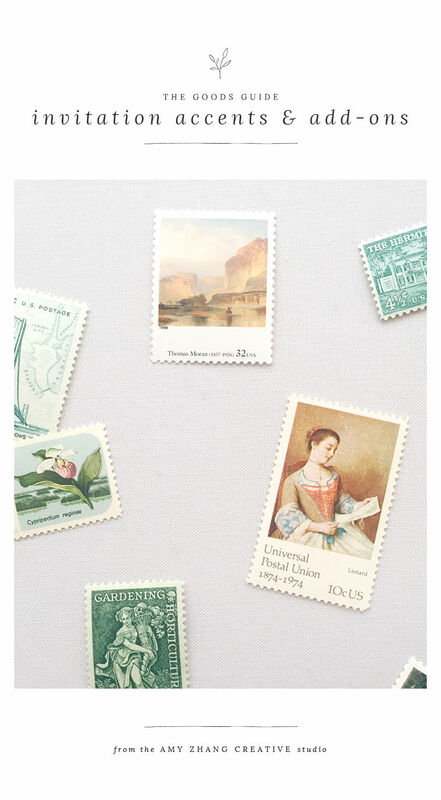 I personally love a curated set of vintage stamps — you can coordinate the colors with your invitations, and they add a ton of character to your envelope (check out my favorite vintage stamp shop HERE). The downside is that you'll have to spend more time prepping your envelopes, but it's not bad when the process is accompanied by a Netflix show and a glass of wine! Another fun option is to use a service like Zazzle to create custom stamps with a coordinating illustration, your initials, or even a photo. Are you ready to get started on your wedding stationery? You can learn more about the semi-custom collection and process HERE or fill out an inquiry form to get started with the custom design process!